This was the year of a memorable 'warm-up'. Top comedian Tommy Trinder was given the task of opening the Royal Variety Performance 1950 at the Palladium and attempted the daunting job of cajoling the notoriously unresponsive audience into life. He was ably assisted in this by the Crazy Gang who appeared in the Royal Box disguised as cleaners and started tossing our disregarded programmes and other debris, while light-heartedly threatening parts of the audience with violence if they didn't liven up. At one point Bud Flanagan dashed into the auditorium, grabbed the young Marquis of Blandford from his aisle seat and ripped out the poor man's starched shirt front. (Little did the astonished audience know that this was actually a paper dickey which the Marquis had willingly agreed to put on earlier in the manager's office). 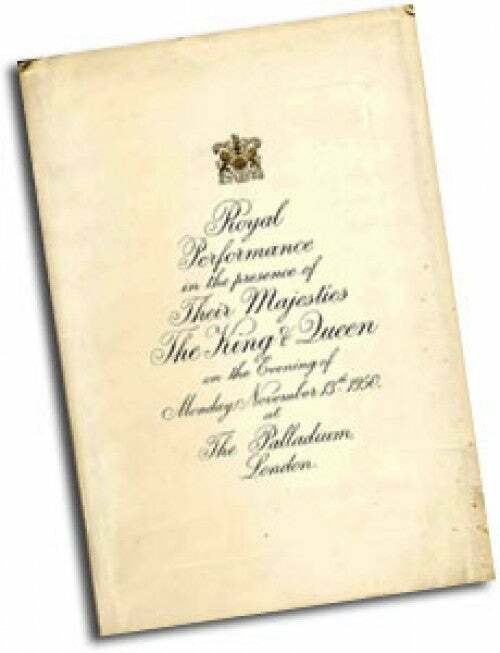 To underline the message , Tommy Trinder jokingly introduced the first act, telling the audience, "Now, you've all be warned - well, perhaps not all of you" as the Royal party took their seats. Trinder was one of the big hits of the show which also saw Jack Benny the American comic, legendary British comic Max Miller, Max Bygraves and Max Wall. 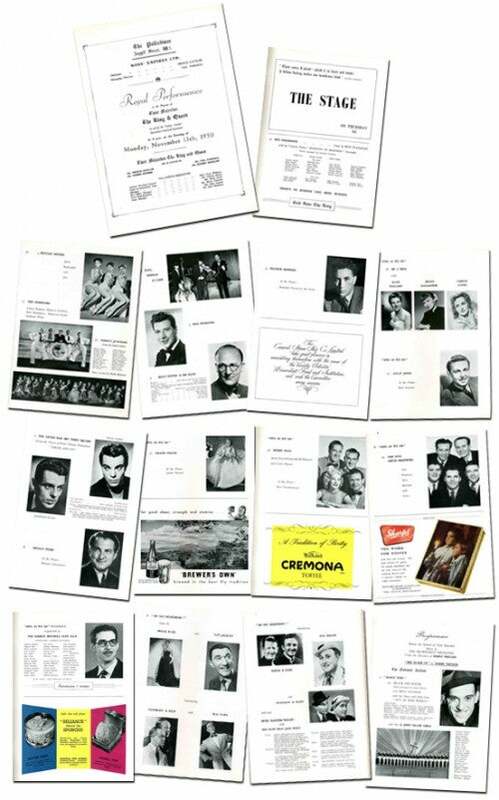 Musical interest was supplied by, among others, Gracie Fields, Billy Cotton and his band and Jack Hylton. Meanwhile, the first half of the show was given to the theme 'Dance Time', with dancing led by Sheila Matthews, with contributions from the twenty John Tiller Girls and a group called the Debonairs. As any artiste will confirm, every little detail counts, everything has to be perfect for the big night. The white dress of Dinah Shore was somehow dirtied by the microphone. The stain must have been very small as Val Parnell assured her that it could not be seen from the front seats or the Royal Box - but even so, it had to be rushed away to be cleaned. Stage presence and confidence had to be maintained - as Dinah said, "I know it's there and it spoils it." A few days before the 1950 show - the 21st Royal Variety Performance - organisers, Val Parnell and Harry Marlow threw a party for the artistes (and press) at London's Cafe de Paris. In his amusing speech, American comic Jack Benny, who had flown all the way from the States for his appearance, recalled that when he stepped off his aeroplane Mr Parnell said to him, "You have four minutes on Monday, and don;t you overdo it!" Benny told the audience he was only concerned about his expenses! When Mr Parnell spoke, he said he couldn't;t add to what had previously been said. "Yes you can, you can add another six minutes to my time!" interrupted Benny, to laughter all round. In an extremely candid account of what it feels like to have been less than a rip-roaring success, Frankie Howerd summed up the pain of personal failure on the big night. "My contribution was not the howling triumph it might have been. In fact, I was a failure....I went into my act, but my usual laughs didn't come; I could feel my throat drying up. Emotions crowded in upon me - panic, a determination not to show it, a terrible feeling of loneliness, helplessness, defiance and Heaven knows what! I kept on talking. I struggled, but apparently they didn't think I was funny, and after a while I became quite certain myself that I wasn't. They applauded at the end- how much I have no idea - and I rushed into the dressing-room. As calmly as I could, I sat down and took my make-up off. My hands were trembling - I wanted to crawl into a hole and hide! I did the next best thing. With a hat pulled well down, and coat collar turned up, I walked out of the Palladium stage door and moved unrecognised through the still waiting crowds, through to Oxford Street and other streets I do not remember. I cannot describe how terrible I felt; I had let so many people down, including myself." In the eyes of many, this year's show will be remembered as the one in which Max Miller deliberately ran over his time. The problem stemmed indirectly from Jack Benny, who had been allocated longer on stage, not unreasonably as he had traveled all the way from the States where he was a huge box office draw. Max Miller knew that he was as big a box office draw on this side of the Atlantic, however, and, abondoning the routine he had gone through in rehearsal, he added several extra gags. 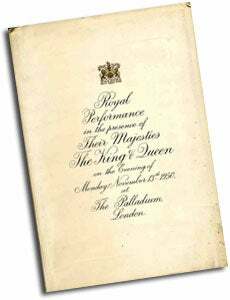 The audience loved it, but, being well over his alloted time, he was straining the accepted protocol of 'royal shows' that timing should be stuck to. Charles Henry was standing in the wings calling "Come off Max"
When Max eventually did quit the stage, Val Parnell, the Guv'nor of Moss Empires, told him in no uncertain terms, "You'll never work in one of my theatres again." "You're twenty-five thousand pounds too late," Max is reported to have replied, besides which the impresario had already engaged him to play Nottingham soon afterwards. Indeed, it was only a relatively short time before box-office returns and a little reflection on all sides had him reinstated. From "Out Of This World": Sheila Matthews, The Twenty John Tiller Girls, Three Bentley Sisters, The Debonairs, Terry's Juveniles.